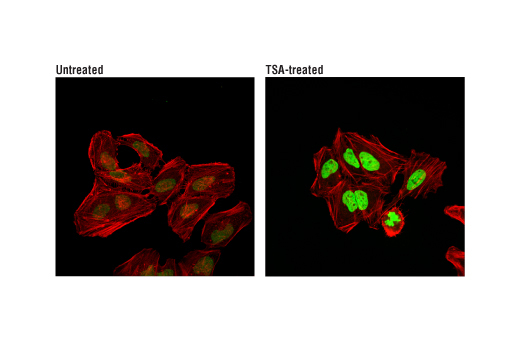 Confocal immunofluorescent analysis of HeLa cells, untreated (left) or treated with Trichostatin A (TSA) #9950 (1 μM, 4 hr; right), using Acetyl-Histone H4 (Lys16) (E2B8W) Rabbit mAb (Alexa Fluor® 488 Conjugate) (green). Actin filaments have been labeled with DyLight™ 554 Phalloidin #13054 (red). Flow cytometric analysis of Hela cells, untreated (blue) or treated with Trichostatin A (1uM, ON; green) using Acetyl-Histone H4 (Lys16) (E2B8W) Rabbit mAb (Alexa Fluor® 488 Conjugate) (solid lines) or concentration-matched Rabbit (DA1E) mAb IgG XP® Isotype Control (Alexa Fluor® 488 Conjugate) #2975 (dashed lines). 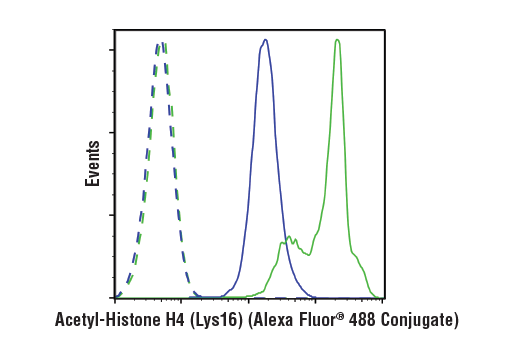 Acetyl-Histone H4 (Lys16) (E2B8W) Rabbit mAb (Alexa Fluor® 488 Conjugate) recognizes endogenous levels of histone H4 protein only when acetylated at Lys16. This antibody does not cross-react with other acetylated histone proteins. This Cell Signaling Technology antibody is conjugated to Alexa Fluor® 488 fluorescent dye and tested in-house for direct flow cytometric and immunofluorescent analysis in human cells. This antibody is expected to exhibit the same species cross-reactivity as the unconjugated Acetyl-Histone H4 (Lys16) (E2B8W) Rabbit mAb #13534.